Socioeconomics in Israel at a glance: what is the picture of the nation? What will Israel’s population look like in 40 years? How much does the government spend on welfare and health services? Are Israelis’ educational achievements improving? 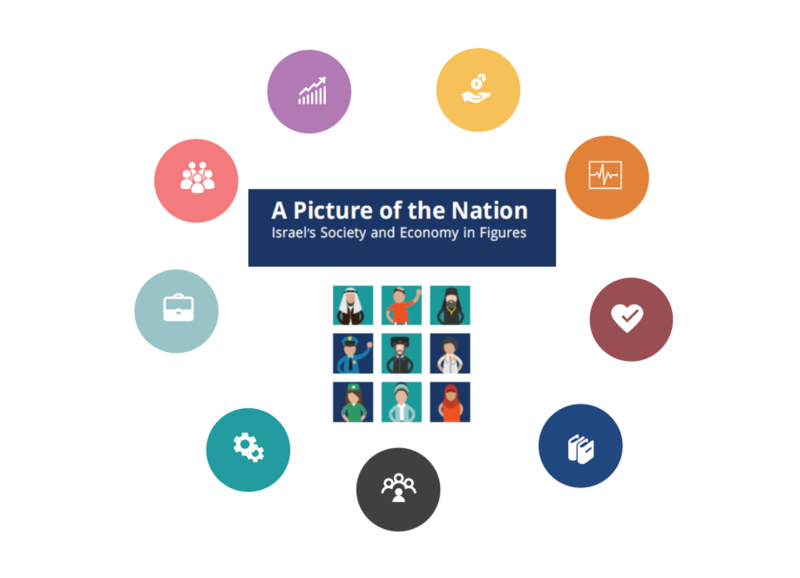 The Taub Center’s A Picture of the Nation 2018, generously supported by the Koret Foundation, presents a complex picture of Israeli society by exploring trends in demographics, macroeconomics, welfare, health, education, and employment. We are pleased to share a number of the findings from this year’s booklet, edited by Prof. Avi Weiss, President of the Taub Center. Israel’s current population is comprised of approximately 74% Jews, 21% Arab Israelis, and 5% defined as “Other.” Haredim are estimated to be about 12% of the total population, and the share of secular and traditional Jews (both those identifying as religious and less religious) – about 56%. While the total fertility rate in Israel is high and stands at 3.11, almost double the rate in OECD countries, there have been substantial changes across Israel’s population groups in recent decades. Fertility rates have fallen greatly among Arab Israelis, while among Jews there has been an increase in fertility since 1990. An examination of first grade enrollment in Haredi, State-religious, and State (secular) schools in comparison to fertility rates, and of transfers between education streams from first to eighth grades, reveals that student movement is in the direction from more to less religious streams (see figure). If the trend of secularization indicated by this student movement continues, the Haredi population is expected to make up about 21% of the population in 2059 (compared with 27% in Central Bureau of Statistics projections). The standard of living in Israel has increased over the past decade. For many years real wages did not rise despite a rise in productivity, but changes in the past few years have reversed this trend and real wages have risen. However, the Israeli economy is characterized by stark polarization. For example, high-tech salaries are 2.5 times higher than wages in the rest of the business sector. In terms of prices, price levels in Israel are still 14% higher than the OECD average, despite a decline in recent years. In particular, prices declined in industries exposed to competition from imported goods such as clothing and furniture. Rental prices in Israel have risen on average 2% faster than inflation per year since 2008, meaning that throughout the period demand increased more than supply. Housing prices have risen at an even faster pace since 2008, though in recent months they stopped rising. There has been an increase in employment rates in Israel, and the unemployment rate has continued to decrease. 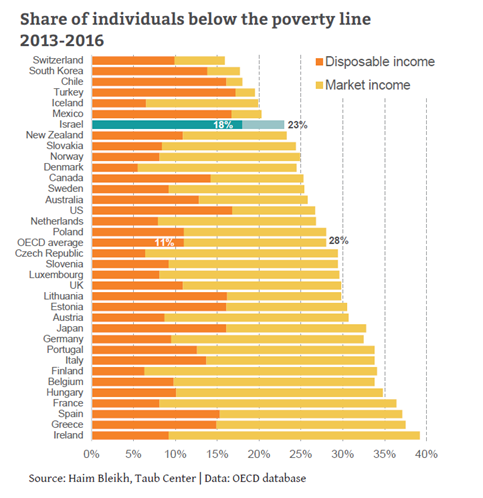 At the same time, the poverty rate when measured using disposable income is the highest among OECD countries (see figure). The percentage of government expenditure devoted to social spending is increasing, but at a very slow pace, and most of the increase has been in the health and education budgets. With regard to addressing poverty, specifically, the sum allocated to the implementation of the Elalouf Committee for the War Against Poverty in 2017 was only 31% of the Committee’s budgeted recommendations. However, a considerable sum was allocated to the “Savings for Every Child” program, which appeared among the recommendations but was not budgeted. Whether more or less well-off, about 37% of Jewish Israeli households spend more than their income. Among households seeking assistance in financial management, those with higher incomes owe more to banks, and those with relatively lower incomes borrow more from family members and friends. Health spending out of GDP has remained stable, despite an increase in medical needs due to rising life expectancy and the aging population. This has resulted in a decrease in health spending per person, and an increase in the cost of medical care. Though there has been relative stability in total health spending, the gap between the share of public expenditure as a percent of total health expenditure in Israel and its share in the OECD has increased almost threefold over the past two decades. As a result, households are spending more out-of-pocket on health services, particularly by purchasing private insurance plans. An examination of health in the Arab Israeli population shows that life expectancy at birth is four years lower than for the Jewish population, and lower than the average in OECD countries. One of the reasons for this is that the infant mortality rate in the Arab Israeli sector is three times higher than in the Jewish sector. More generally, the lower socioeconomic status of the Arab Israeli population has an impact on health levels. One of the goals of the past two Ministers of Education was to increase the share of students studying advanced math. The share of those qualifying for a bagrut certificate with five unit-level math did indeed rise from 10.6% to 13.8% between 2013 and 2016. Another goal of the Ministry – to increase the share of students in vocational tracks – is also proving successful: the portion of students in vocational tracks increased from 33% in 2010 to 36% in 2015 in the Hebrew education system, and from 40% to 43% in the Arab education system. 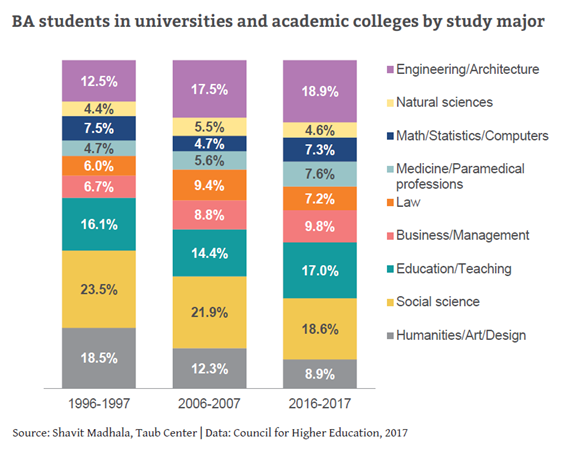 In higher education, the past two decades witnessed a decline in the percentage of students studying humanities and the social sciences, while the share of students studying business administration, medical professions, and architecture and engineering has risen (see figure). Among Arab Israelis, the percentage of female students studying science and technology subjects in high school is high and continues to rise steadily, but they tend to pursue degrees and careers in education at very high rates. In general, employment has increased among men and women in all sectors – including for Arab Israeli women and Haredi men (for whom employment rates are particularly low). Within the Haredi population, employment rates rose over time in all Haredi streams, both for men and for women. Among Haredi men ages 23-30, Chabad men work at the highest rates, with almost 50% employment in 2013. Together, these and other important trends presented in A Picture of the Nation 2018 highlight some of the most crucial social and economic issues facing Israeli society. We hope this publication can serve as a resource to the Israeli public and assist Israeli decision makers in basing their choices and actions on unbiased data and professional analyses.